Grant Hollister is restoring a painting and when he turns his head, the painting starts to bleed blood. Grant frantically tries to stop the bleeding and as suddenly as it began, the bleeding stops, leaving no trace at all that it happened. A nervous Ichabod is getting ready for a date with Katrina (yes, roll your eyes) and he complains about not understanding the modern business casual look. Abbie suggests staying in, pointing out that a night out isn't going to fix what happened and that Katrina has done things to effect their team. 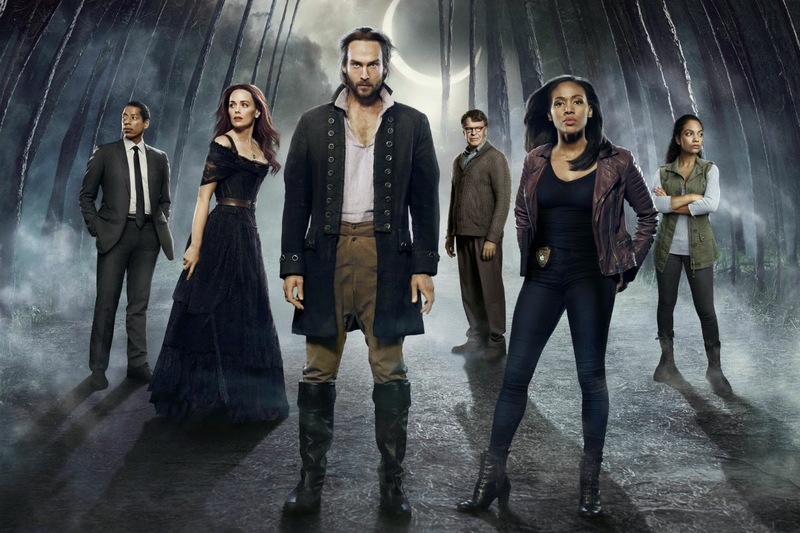 However, Sleepy Hollow is #Cranewrecked so the date must go on. Ichabod however believes that he and Katrina owe it to each other to see who they are to each other in these modern times and says that tonight isn't about the team. When it is ever about the team? All he has done is continually make excuses for Katrina's inexcusable decisions and action. It seems that Crane plans to take Katrina to an event at the historical society featuring the Adams family. Ichabod reveals that the Adams' were more Katrina's friends than his and that Katrina delivered all five of their children. Is there anyone in pre-revolutionary America that Ichabod didn't know. At the event, Ichabod and Katrina look at the painting that Hollister was working on and Katrina says that she has no memory of it in the Adams home. They start to move on with the tour of the Adams' affects when they are joined by Hollister, whose fingertips are still red. Hollister asks for a moment to speak with Ichabod. Hollister asks if Ichabod believes in spirits and brings up Sleepy Hollow's unusual history. Before Ichabod can answer, Hollister is pulled away by Miller, who wants to know about the cracks in the frame of the painting. In the meantime, Katrina has a recollection of Abagail Adams. When someone touches the painting, Katrina has a dizzy spell. Ichabod quickly rushes to steady Katrina, who says that she felt an evil presence. Ichabod suggests that they both keep their eyes open, because Grant has also felt the presence of evil. Abbie is at work at the station looking through her family journal, when Irving arrives at the station. Frank is immediately placed in handcuffs and taken away, as a stunned Abbie looks on. Ichabod and Katrina are now seated at the Adams' table and Katrina expresses sadness for not getting the chance to say goodbye to her friend Abagail Adams. Ichabod comforts Katrina by saying that he experienced this sense of loss himself, adding that they must try to make their way in the present once again. Katrina says that she feels that these memories have a purpose. Suddenly, there's a scream and when the tour group check it out, they find Grant dead and hanging by his feet. Abbie calls Crane to inform him that Frank is alive. Crane is shocked, pointing out that they saw Frank die on the battlefield and Abbie responds that they saw Frank die but no one else did. Now everyone thinks that Frank is a cop killer who has been in hiding. Crane believes that this is Henry's work and that Frank has been brought back in a fashion similar to Andy Brooks. They then talk about Grant and Abby believes that there is a connection between Frank returning and Grant dying. Abbie warns that Reyes is going to arrive shortly to start investigating and so, she suggests that Crane start investigating fast. Crane reveals that Katrina felt a dark presence at the dinner. Katrina stares at the body and gets a vision of a tarot card with a figure in the same position as which Grant's body is hanging. Reyes makes her way over to Katrina and is surprised to learn Katrina is Ichabod's wife, commenting that Crane never mentioned Katrina. Reyes asks Katrina and Ichabod to stick around until they wrap things up because Ichabod's aid could be valuable. When Reyes leaves, Ichabod approaches, telling Katrina that what happened to Grant is a specific ritual meant to invoke the hanged man. Once again, we get an image of the tarot card. Katrina is surprised to learn that Ichabod has been reading the tarot and reveals that the hanged man represents trouble. Katrina says that Grant's death is similar to a series of deaths which happened in 1781. Why am I not surprised? Katrina reveals that she learned the secrets of the case from Abigail Adams. It seems that the carotid artery had been targeted and Abigail believed that the culprit had a medical background. When Crane suggests that they are dealing with the same sort of threat, unsurprisingly, Katrina says it's a threat she was powerless to stop back then, suggesting that Crane should call on Abbie for assistance. Crane declares instead that they should work together on this because of the usefulness of Katrina's memories. Crane should call back up right now because Katrina does not have a history of being good at anything besides tipping off the enemy. Abbie heads to see Frank who is handcuffed. Franks says that he can only remember being given a sword and fighting the horseman of war. Abbie tells Frank that he died in the battle and was buried six weeks ago and that Cynthia and Lacey have been grieving his loss. Abbie adds that since Frank's soul belongs to Parish, Frank's presence is a sign of Parish's return. Frank is appalled at the idea that Abbie would believe that he is dangerous, adding that he came to the station looking for Abbie and a safe place. Abbie takes Frank's hand and says that she cannot risk being betrayed and brings up what happened with Brooks. Frank suggests bringing Cynthia to the station because she will be best able to tell that it's really him. Abbie gets up to leave, as Frank begs her not to leave him like this. Crane and Katrina make their way back to the painting and notice that their is now blood on the painting. Crane then realises that the murderer has been there all along, hiding in the place no one would think to look. When Crane looks at the painting again, this time, instead of the artist looking away, he's facing him. Ichabod wonders how this is all possible and Katrina suggests that the painting could act as a doorway. When Crane looks at his hand, he notices that his fingertips have blood on it, causing him to wonder if Grant disturbed the image while restoring it. They then discuss Colby, the painter and learn that he disappeared without a trace in 1782. They surmise that Colby, who is trapped in the painting, is using the blood he collects from the murders to finish his unfinished work and thus free himself. When Abbie and Crane return to the painting Colby is gone. Crane then remember seeing Miller touch the painting when he was arguing with Grant and that Miller had red paint on his hands. Crane surmises that the red fingertips must be how Colby accesses his victims. Crane moves to look for Miller, when Katrina stops him to point out that he also has red fingertips. Katrina says that no one else should be let near this painting and then grabs Ichabod and kisses him as a distraction when a woman enters the room. Jenny has arrived at the station and Abbie tells her that Frank is alive and back. Abbie expresses her doubts, saying that this is not their first time with a resurrected soul. Jenny is adamant that Frank is not the same as Brooks, who made a deal with Moloch. Jenny reminds Abbie that Irving is their friend and went to prison to protect his family and died fighting for them. Abbie says that she will never forget that but the key phrase is that Irving died. Abbie believes that Frank can only he here on Henry's behalf. Jenny argues that Henry is gone and that because Henry died Irving's soul was released. Abbie says that until they know for sure, they need to be prepared. Abbie asks for a weapon in case they need to put Irving back in the grave. Jenny responds that Hawley is out of town but adds that Abbie can count on her for this. Jenny tells Abbie that she hopes that they won't have to use a weapon. At the station, Abbie sits down with Cynthia, who says that she understands that Abbie is dealing with forces she cannot begin to understand. Abbie then shows Cynthia video feed of Frank sitting in the interrogation room, adding that Frank turned himself in but has no memory of how he got there and what happened to him after he died. Abbie reveals that to everyone else, the manhunt is over but to them, Frank is back from the dead and no one can ever know that. Cynthia demands to see Frank but Abbie says that they cannot take that risk until they know if Frank is dangerous. Abbie brings up the blood pact Frank made with Henry and adds that they need to know for sure, if Frank is there to pose a threat. At the historical society, Crane talks with Miller about what happened to Grant. Miller reveals that Grant said that he heard a voice coming from the painting which expressed a desire for blood. Miller reveals that he believes Grant because he heard the voice as well. Katrina heads over to Abigail's desk and gets a vision of Abigail opening the drawers in a specific order. When Katrina does the same, she pulls something out of a drawer. When Katrina turns around, she sees a bloody figure moving through the halls, holding a knife. Jenny is on the phone with Abby. Jenny digs up a body to retrieve bullets made from the gates of hell and is not at all impressed to dig the bullets out of a rotting corpse. Is it me, or does Jenny always get all of the dirty work? When Jenny pulls out the last bullet, the corpse reanimates, forcing her to stuff it back in the body. Back at the historical society, Crane tells Miller that he needs to leave immediately because the police cannot protect him. Miller is concerned that the police will think he is running because he is guilty. When Crane turns his back to open the dumbwaiter, Miller disappears. Crane makes it back to the room with the painting, just in time to see Miller being dragged into the painting. Crane grabs Miller's feet, as Katrina watches but is unable to save him. See, now would have been a good time for Katrina to actually do something but feel weak and sense evil spirits. Crane focuses on the scratches pn the painting and Katrina says that they are to keep the murderer inside. Katrina looks through the packet she took from Abigail's desk and learns that Abigail allowed herself to be captured and with the help of Reverend Knap they trapped Colby. They are interrupted by Reyes, who is looking for Miller. The Cranes claim that they are taking the opportunity to appreciate Grant's work one last time. When Reyes leaves, Crane wonders about entering the painting and stopping Colby. Katrina believes it is possible but suggests that they are going to need privacy. Crane grabs the painting and they head to the area where Grant restored artwork. Crane and Katrina both lay hands on the painting. Crane is horrified that Katrina is putting herself at risk and she explains that she will not be separated from Ichabod again, adding that she is going to make sure Colby remains imprisoned for Abigail. Katrina then says a spell and they join hands. Katrina and Crane then find themselves inside the painting. Jenny arrives at the station to see Frank being led in handcuffs by officers. Frank is not allowed to stop and talk, so Jenny tells him to hang in there. Jenny then heads to see Abbie, who says that Frank is being transfered to a holding cell. Jenny hands over the bullets, asking Abbie to promise that they will be used as a last resort. Abbie again asserts that they need to worry about Frank's soul. Jenny suggests that maybe Katrina can discover if Irving can be discovered, though she does acknowledge that neither of the sisters like Katrina. Abby calls Ichabod but gets no answer because of course, Crane and Katrina are inside the painting. Cane and Katrina make their way through the painting looking for Miller. They find Miller hanging by his feet with a pool of blood on the ground. Katrina and Crane lower Miller to the ground and Katrina starts to say a spell. A bloody Colby appears and Crane tells Katrina to finish the spell and get them out of there. When the Cranes return to their normal time, the painting is clearly finished. Crane grabs paint thiner to destroy the painting but is grabbed by Colby. Ichabod manages to pull away and in the process, Colby exits the painting. Abby appears and shoots Colby but Ichabod yells for her to shoot the painting instead. Abby fires four shots into the painting and Colby falls to the ground. Abbie simply explains her presence to the Cranes by saying that Ichabod didn't answer his phone. Later, Colby's body is taken out and Abby asks if Miller is going to be okay. Reyes reports that Miller will be fine and while the knife used to kill Grant was found on the suspect, they were unable to find any further identification. Crane suggests that the killer is simply a vagrant. Abbie asks if Reyes has any other instructions and Reyes reminds Abbie that she gave her direct order not to speak to Irving. When Reyes leaves, Crane simply states that one of them will always be out of favour with Reyes. Crane then thanks Abbie for her timely arrival. Abbie tells Crane that the next time he decides to jump into a painting, he needs to text her. Crane excuses himself and heads to see Katrina, who is sitting at Abigail's desk. Crane tells Katrina that one Abigail has guided her to another. Ichabod tells Katrina that they will find a new state of being together.Why of course they will. Abbie is back at the station, and she apologises to Reyes for seeing Frank behind her back. Reyes says that she understands that Abbie is loyal to Frank. Reyes then reveals that the D.A. called to say that they have received evidence which will clear Frank. We finally got Frank back and while I understand Abbie's concern about him being like Brooks, it feels so much like Frank has been short changed. At the beginning of the season he was just dumped in the asylum and completely forgotten about. How is this showing the loyalty that Reyes spoke of? Frank was far more valuable to the team than the supposedly powerful Katrina has been to date and yet he is so easily cast aside. I want to see Frank reintegrated into the story and for the other characters to finally show some kind of concern for his well being. Frank has sacrificed so much and gotten so little support in return. Instead of dealing with Frank what we got was essentially a monster of the week featuring the Cranes. Does anyone still care about their relationship? Am I the only one bored by the Cranes? We are supposed to believe that Ichabod is a highly intelligent man and yet he keeps going back to Katrina. I get the whole, the heart wants what the heart wants but this is just at the point of epic ridiculousness. I don't need to see these two go on a date night, make googly eyes at each other, or kiss. I simply want Katrina dropped in a plot box and disappeared until I can forget how horrible her character is. Having Crane and Katrina working together essentially pushed both Abbie and Jenny out of the loop. This show works because of the relationship between Ichabod and Abbie, not Ichabod and Katrina. I hope this episode isn't foreshadowing what we can expect to see for the rest of the season. I am further disturbed by the implication that Abbie will be there to pull their butts out of the fire. Abbie is not a servant but an equal team member, which Crane clearly forgot when he chose to jump into a painting with Katrina the incompetent. I am actually surprised that she didn't try to justify saving Colby, I guess he just wasn't evil enough for her. I suppose a mass murderer is nothing compared to one of the horsemen of the apocalypse Katrina is determined to care deeply about.